"Mashed potato cakes have been a staple in my southern family all throughout my childhood. I came up with this recipe when trying to put a new spin on an old favorite." Made tonight! I used cheddar cheese instead of American it was FANTASTIC!!! great! made a few modifications. No bacon, used ham & less flour. Don't mess with them while they are cooking or they fall apart. Leave em be! I have made this for years. I always try to have leftover mashed potatoes of whatever type. (loaded or not). 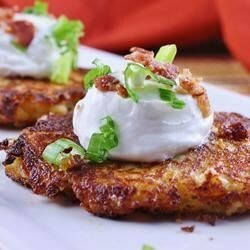 Mashed potato cakes are great with bacon and eggs. It needed salt! I added some to the water and additional in the mix. Still needed a little more but next time I make this, I know how much to add!! Thanks for sharing! !